What Sets Wood-Mode Cabinetry Apart from the Rest? There’s a reason we’ve chosen Wood-Mode for over 42 years. You know the old adage “you get what you pay for?” At Kenwood Kitchens, we feel that you should get more than what you pay for. That is why we have not strayed from making Wood-Mode our premium go-to custom cabinet line for over 42 years. Along with Brookhaven Cabinetry by Wood-Mode, we can offer many price points with an array of door styles, wood species and finishes without giving up exceptional quality and workmanship. Our installation crews take pride in installing such well-built cabinets, knowing that our customers will enjoy their kitchens for a lifetime. Since its early years, Wood-Mode has maintained a firm commitment to sound environmentally-protective policies and practices in the manufacturing of its custom cabinetry. The company has taken pride in producing the industry’s highest quality cabinetry in a manner that demonstrates its genuine concern and care for the environment. Wood-Mode’s Lifetime Limited Warranty reflects their commitment to product excellence and customer satisfaction. 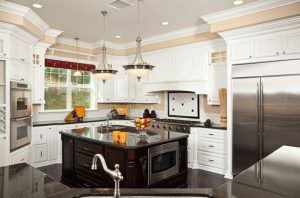 As one of Wood-Mode’s top dealers in the nation for many years, Kenwood Kitchens can offer these products to our customers with confidence knowing that our reputation is on the line every day. What’s better than a kitchen that meets all your needs? Wood-Mode cabinets are thoughtfully designed to meet every need of the homeowner in the kitchen. Innovative storage design helps you to keep the kitchen organized and reduces clutter. Wood-Mode’s unique lighting program places LED lights in strategic positions around the kitchen to highlight and define spaces as well as vary moods and create atmosphere. The integrated methods of lighting, wiring, and switching makes it easy to modify lighting designs, eliminating the need for on-site retrofits and setting Wood-Mode apart from lighting programs offered by other cabinetry companies. 100% off the drawer/door style premium (stainless steel and backpainted glass styles will receive 50% off). Click here to read more about this promotion, or visit a showroom today! This entry was posted on Wednesday, April 12th, 2017 at 12:49 pm. Both comments and pings are currently closed.